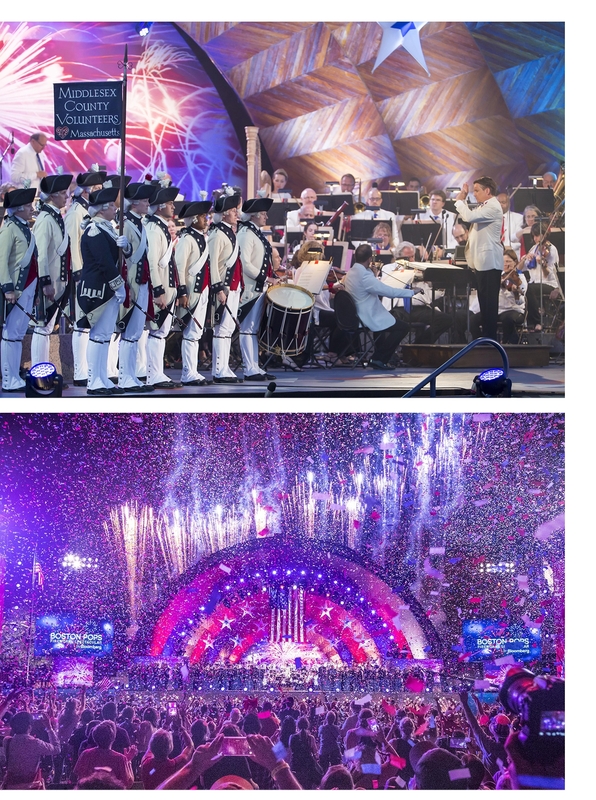 LD Mike Berger Chooses 4Wall New York to Light Iconic Boston Pops Fireworks Spectacular | Press Center | 4Wall Entertainment, Inc.
Boston, MA- The Boston Pops Spectacular is a cherished tradition in Massachusetts that spans over 40 years. Thousands gather to watch the stunning fireworks display while the orchestra plays the "1812 Overture" at the historic DCR Hatch Shell. Lighting Designer Mike Berger, of Full Flood Inc., utilized 4Wall's coast to coast capabilities working with 4Wall New York and 4Wall Los Angeles. This year was Berger's second time lighting the event and with some changes to the broadcast, the LD faced a pretty large budgetary cutback. Berger was forced to adjust his design approach and improvise with a smaller lighting package than the previous year. "From an overall show standpoint, we really focused our work on the orchestra and shell and tried to cutback on the ancillary areas," explained the LD. "The producers and our director were incredibly helpful in condensing the locations down so we could effectively use our budget." The LD made some big cuts to the moving lights package from last year and increased his conventional package to help bridge the budget gaps. "Where we had once lit the audience and trees with moving lights, we deployed a large quantity of Par 64s," said the LD. This year was also the first time the Boston Symphony Orchestra took full responsibility for the overall production and the goal of the lighting design was to tailor it to their world. "The show is both a celebration of their work and the history of America," said Berger. "It was important to visually keep the July 4th feel going while interweaving other unique musical moments during the course of the show." 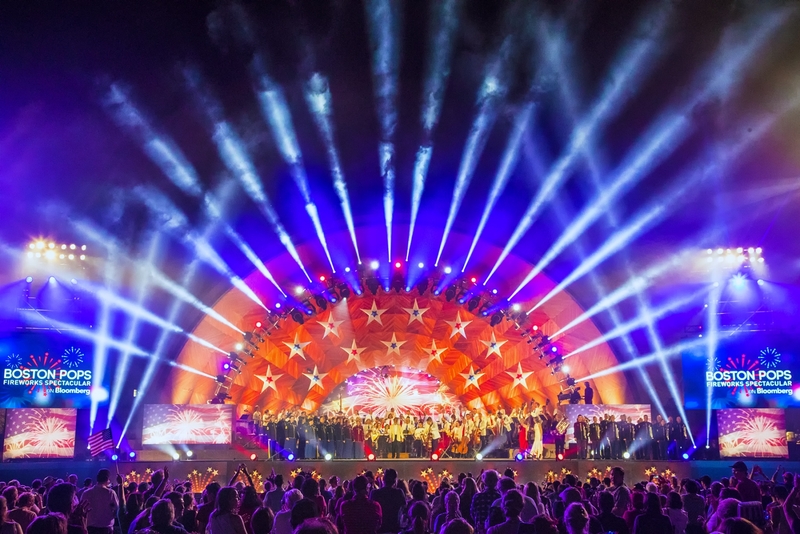 The lighting design consisted of three primary locations: the hatch shell, a backstage host interview mark, and the U.S. Army cannon location. For the shell, 6 scaffolding towers were erected as well as the arch truss which sat inside the hatch. This is where most of the gear landed. "We split the purposes of the towers to include light for the stage, audience and trees surrounding the oval," said the LD. "The arch itself held most of our effects lights as well as equipment to light the orchestra." 4Wall New York provided a moving lights package which included Martin MAC Aura XBs, Vari*Lite VL3500 Spots, VL4000 BeamWash, Clay Paky Mythos 2's, and GLP Impression X4S fixtures. "The XBs were predominantly used to dive into the camera for hokum," said Berger. "The brightness and quality of the beam was not something I had anticipated having but wound up creating some of the most striking looks of the show." The VL3500s and VL4000s were the LD's workhorses for the show. "We peppered the VL3500s throughout the rig and used them all night for performer back and key light," said Berger. "The VL4000 was one of the brightest lights I've had a chance to use and adding it to the rig was a no-brainer." The Clay Paky Mythos 2 fixtures replaced the Clay Paky Sharpys that were on last year's rig. "The Mythos not only gave us the great beams we had come to expect from the Sharpy, but also opened up new doors with its rich feature set," explained Berger. "Lighting Director Ryan Tanker, who was behind the console, made great use of the animation wheel, zoom, and color mixing features." The GLP Impression X4S lights were the perfect size to hide in the shell in order to provide toning to the orchestra. "They pack a ton of brightness in for their size and are the perfect light for this purpose," said Berger. The control system, provided jointly by ETC and 4Wall NY, was comprised of 2 ETC EOS 32k Ti consoles, a 32k Gio console and, 8 ETC Net3 Gateways. "Nick Gonsman and the team at ETC New York were instrumental in making this control system possible. We are truly appreciative of their help and support." said Berger. The LD was satisfied with not only the gear 4Wall provided, but also the coast to coast service from two different 4Wall locations. "I really cannot say enough about the support I get out of the LA and New York offices. Jeff is an incredible collaborator and is always willing to work with me to make the greatest show possible," said the LD. "Al's relationship with the Boston Symphony Orchestra and the ability to pull the show out of the New York office made the entire process flawless." Berger also had high praises for his crew that made the show possible. "Our gaffer Eric Norris deserves a huge amount of credit for this show. He did a spectacular job keeping a ton of information organized and the crew operating smoothly," said the LD. "Ryan Tanker sat behind the desk again this year and was instrumental in creating a variety of unique looks. He and I have a great creative working relationship and that allows us to move quickly through our limited dark time on this show." Berger continued, "Philip Rheinheimer joined us this year as an Asst. Lighting Director. He managed to get his hands in almost every part of the show, and was a real asset to the production." said Berger. "Chris Werner, our lighting director took command of the audience, trees and cannon focus. It was great to have him join the team this year. I knew that when handing off those projects to him, I no longer had to worry about them."